Our mission is to provide our customers with a quality car at an affordable price. We will strive to do our best when transacting any kind of business. We pride ourselves in our professionalism and measure our success not by the number of cars sold, but by the happiness of our customers.With total focus on customer satisfaction. Peter Morris Cars Ltd. is a family owned and run business that has its sights set on quality, from presentation of vehicles to workmanship in our busy workshop. With some 40-50 hand picked used vehicles on site, and a quality after sales team for all your requirement, we are situated on the main ring road of the famous market town of Wellington, Shropshire. “Some 60% of our sales business is buying to customer orders, to specific requirements and budget” says Peter. Peter Morris, Director, Chris Williams, Site Manager. 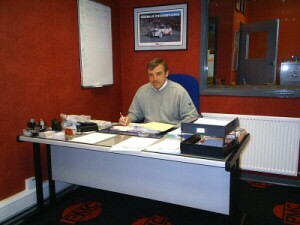 Chris joined PMC in January 2001 and has recently taken the post as Site Manager. Chris also has responsibilities for our VOSA MOT Testing and is a senior technician in our busy workshop. Chris is available for any technical advice or help on 01952 222 991. An investment of some £50,000 to introduce a new MOT facility has enhanced the possibilities for our customers, they can now buy a vehicle, have it serviced, valeted and MOT’d all on this site. All of our staff are committed to the smooth running of the business and with continued investment in the facility’s we can offer the public exactly what they require for their vehicles, “Things have never been better”. The service bay is open six days a week with no job is too small. Our rates are extremely competitive at £45.95 +VAT per hour and £44.95 for an MOT, we can also offer our customers a courtesy car if booked in advance.